YHH selects the ten best girls high school hockey players that were not or could not be named as a semifinalist for the Ms. Hockey award. Ten semifinalists are chosen for the Ms. Hockey and Senior Goalie of the Year awards annually, where the criteria take into account academic standing and community involvement in addition to on-ice success. All players nominated for either award are seniors and have also displayed exemplary coachability and citizenship, according to Let’s Play Hockey. This list is not an indictment on the Let’s Play Hockey set of criteria, but merely a collection of the best talent (not nominated for Ms. Hockey) that Youth Hockey Hub has seen play this season. Period. The list includes players not old enough to qualify for the award, and a player who may have been overlooked due to a dip in talent due to graduation tinting the team’s overall record for this season. Granted, the list is metro-heavy, but the emphasis is on players that the YHH staff has seen, in-person, and preferably multiple times. The players are listed in alphabetical order. Blaine's Ramsey Parent has totaled 98 goals and 95 assists for the Bengal program in her decorated career. Quick with the stick and a natural in the offensive zone, Branton leads the youthful Trojans with 19 goals and 44 points. The Clarkson commit has totaled three or more points in a single game six times this season, and in just two varsity seasons has recorded career totals of 37 goals and 74 points. Branton and the Trojans carry their 19-6 record into the Class 2A, Section 6 playoffs as the No. 3 seed behind second-seeded Edina and top-seeded Blake. The junior wing is averaging just over two points-per-game (23-28-51) for the 23-2 Bears, with much of her offensive success coming on hustle plays. Burton plays the role of power forward exceptionally well for the Bears, often the target of most defensive abuse on the power play parked in front of the opposing team’s net in the Bears’ umbrella formation. Burton’s ability to do the dirty work for rebounds, coupled with her willingness to act as a screen for Madeline Wethington’s slap shots, make her a major cog in the Blake machine. Burton is committed to Minnesota. Corneliusen has yet to be held point-less through 25 games this season, pacing the state in both goals and total points with 42 and 72 respectively. A dynamic playmaker, Corneliusen combines rare speed with rare power on the ice. The junior is likely to break the 150-point plateau for career points sometime during the postseason as the Warriors look to make their fourth consecutive trip to the Xcel Energy Center in St. Paul. With impressive hockey sense and an appreciation for patience while killing penalties, Delianedis is the rare player that is just as effective on defense as she is on offense. A relentless penalty-killer, Delianedis has been a significant producer for the Bears since her eighth-grade season and is currently enjoying her most statistically successful campaign with 30 goals and 62 points for the top-ranked Bears. In just her second varsity season, Enright has emerged as the Tigers’ top player and could lead the team to its second state tournament appearance in three seasons if she continues her strong play in the coming playoffs. After totaling 16 goals and 27 points last year, the Minnesota commit leads the Tigers with 22 goals and 43 points as a freshman. Of those total points, 15 have come on the power play, a unit that is clicking along at a success rate of 23.7%. Enright is a deft puck-handler and on-ice general in the offensive zone. Hemp, who verbally committed to Minnesota as a freshman, is one of the most talented players in the entire state, regardless of grade. A tireless worker and a more-than-fierce competitor, Hemp shows no hesitation when going into the corners with opponents and plays a highly effective physical game without logging significant time in the penalty box. Hemp has recorded 30 goals and 53 points so far this season, surging past the 100-point career mark in just her second varsity season. Suiting up in the first defensive pairing as a freshman on any team is a nod to abundant talent, but Jungels has done more with her shot at serious ice time. Jungels is currently third on the Hornets in assists with 21 and fifth in total points with 28. 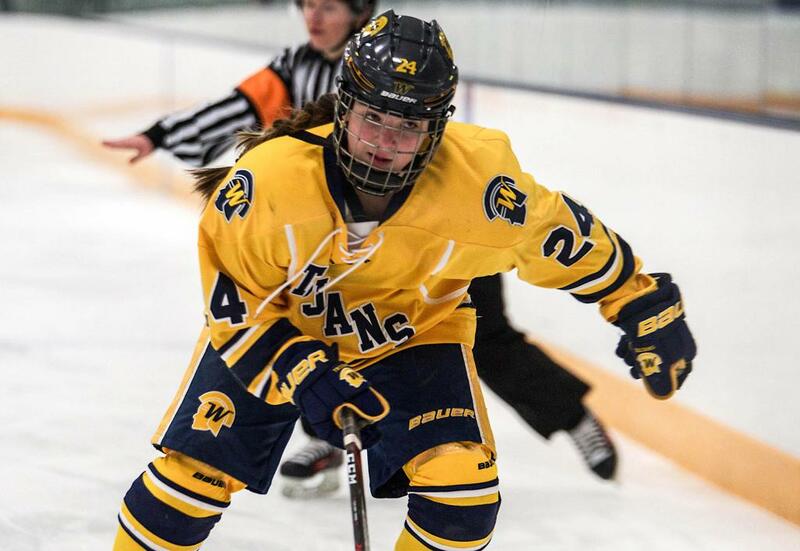 The Minnesota commit has also shown up statistically in close games, recording three goals and seven points during the eight games decided by a single goal during the Hornets’ 21-4 season. The Hornets will hold the No. 2 seed in the Section 6-2A playoffs in a bid for their third straight state championship. Langseth combines speed with a heavy shot as the leading scorer for the Eagles this season and has recorded a stat line of four goals and eight total points in an 8-2 win over Prior Lake on Dec. 1 of this season. Since her eighth-grade season, Langseth has upped her scoring total each year, recording nine points in her first campaign, followed by totals of 25 and 55 in subsequent seasons. Her 58 total points rank seventh in the state for 2018-2019. In addition to the impressive numbers, Langseth’s resume includes three straight trips to the state tournament with the Eagles. On a team full of athletes, Parent might be the most natural of the bunch. The speedy forward thrives in transition and distributes the puck well, often passing into space on the ice and letting her teammates catch the puck in stride as opposed to just handing the puck off to a stationary player and slowing down the entire operation. Parent isn’t afraid to shoot from anywhere, and her quick trigger allows for the Ranger forwards to crash opposing nets and scoop rebounds. Parent is verbally committed to Minnesota-Duluth and currently has scored 14 goals and totaled 27 points for the 23-2 Rangers. Had the Bengals not been hit as hard as they were by graduation the past two seasons, Parent would have been on the Ms. Hockey shortlist. The rugged skater and expert shooter teamed with fellow offensive dynamo Gabby Rosenthal (and several other highly-touted and skilled players) as one of the most dominant offenses in the state for two seasons, and Parent’s numbers (and the Bengals' record) have dipped slightly in the absence of the graduated players. Undeterred, Parent has stepped into a lauded leadership role this season as team captain of the incredibly young Bengals and leads the team in scoring with 27 goals and 39 points. Parent is two goals away from 100 for her career and has totaled 95 career assists entering the postseason. Parent is verbally committed to Ohio State.